Most people that have attempted (and some who have decided to no longer dabble) in the exciting world of paid search or display ads to drive business will be quick to tell you how “it didn’t work”. The follow-up question to that should be “What exactly didn’t work?”. There are a number of nuances that can go wrong when it comes to bidding on search terms or buying display space; but for those that know the rules, it can be very successful to be seen by those looking for what your business has to offer. 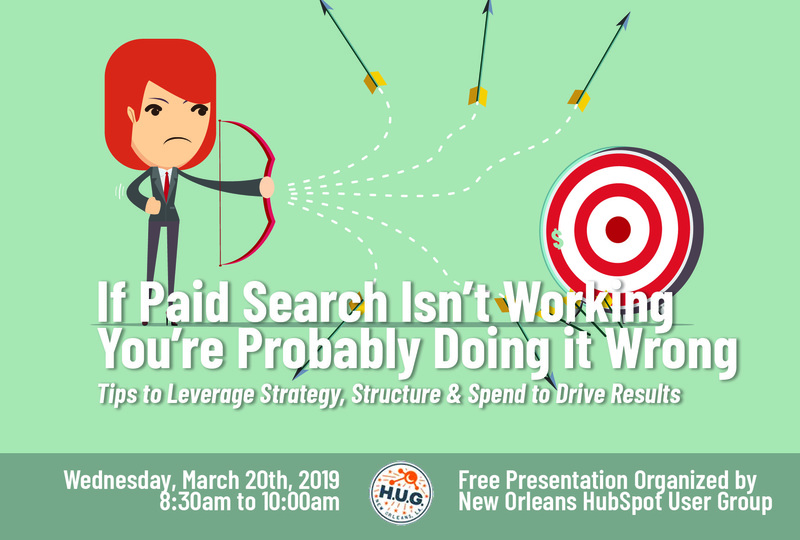 Join us for tips on build out, budget and best practices, with a a side of light breakfast as Adele Tiblier, Chief Marketing Officer of Story Block, presents tips and action items to help you make the most of your paid search efforts. Whether you’re just getting started or already putting money toward it, invest a little time to get a real return on your ad spend. Chatbots are proving to save businesses big bucks, but when you decide to let a robot take over interaction with your prospects or paying customers, there is fine line between functional and frustrating. Delve into how to weigh the pros and cons of bot adoption, and how to build a strategy that is friendly to your visitors, not just your finances. Guided discussion of the most powerful, free tool to track, analyze and report your web site’s data. According to the HubSpot’s State of Inbound report, 63% of marketers stated that their top challenge was generating traffic and leads, followed closely by proving the ROI of marketing activities. These two things are not mutually exclusive, and with tools like Google Analytics (GA) at your disposal, the only limitation is how you are using them. Discussion with MARKETING AND SALES PROS about the fragmented relationship between marketing and sales teams is a tale as old as time, the makings of legendary memes, and the reason your company isn’t CRUSHING its goals. The biggest NOLA HUG event to date, this very special 5-person HUG panel featured incredibly accomplished speakers from a wide range of industries and backgrounds. Dan Marks, CMO Hancock Holding Co.
HubSpot's Juliana Nicholson talks nonprofit marketing – donor communications, nurturing, and how it applies to for-profit businesses, too. Join us for powerful, actionable insights you can put into action the very next day. Email and blogs are two of the most powerful tools in the inbound marketing toolbox. Done right, they will be responsible for a huge percentage of your traffic and conversions. "Done right" being the key. Join us on June 15th as the Story Block Media team breaks down a few of the latest best practices then takes on your real issues. Conversion rate optimization (CRO) for lead generation websites is the process of identifying why visitors are not performing a predefined goal (whether converting by a phone call or form submission) and working to increase those numbers after a comprehensive analysis suggests change. Seems simple, right? Learn inbound. Get certified. Grow your career. Grow your business. The inbound certification course will grow your business and your career by introducing you to the inbound marketing movement. You'll learn how to create marketing that people love through remarkable content, high-converting landing pages, lead nurturing and what we like to call, "customer delight." Marketers looking to round out their digital or content marketing skill sets. Non-marketers who want to learn the inbound marketing methodology. Entrepreneurs building inbound businesses from the ground up. Students looking for internships or full-time positions. Sign Up for Event Updates and More!